Relive the extraordinary Presidency of Barack Obama through White House photographer Pete Souza's behind-the-scenes images and stories in this #1 New York Times bestseller--with a foreword from the President himself. During Barack Obama's two terms, Pete Souza was with the President during more crucial moments than anyone else--and he photographed them all. Souza captured nearly two million photographs of President Obama, in moments highly classified and disarmingly candid. Obama: An Intimate Portrait reproduces more than 300 of Souza's most iconic photographs with fine-art print quality in an oversize collectible format. Together they document the most consequential hours of the Presidency--including the historic image of President Obama and his advisors in the Situation Room during the bin Laden mission--alongside unguarded moments with the President's family, his encounters with children, interactions with world leaders and cultural figures, and more. 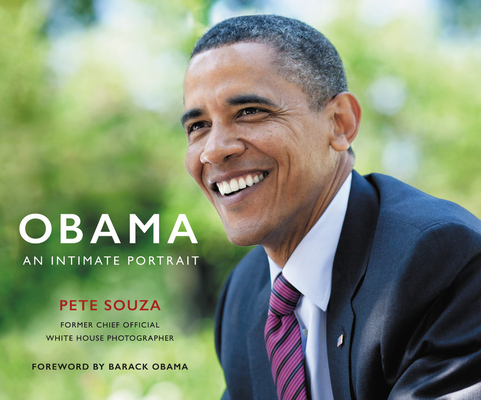 Souza's photographs, with the behind-the-scenes captions and stories that accompany them, communicate the pace and power of our nation's highest office. They also reveal the spirit of the extraordinary man who became our President. We see President Obama lead our nation through monumental challenges, comfort us in calamity and loss, share in hard-won victories, and set a singular example to "be kind and be useful," as he would instruct his daughters. This book puts you in the White House with President Obama, and will be a treasured record of a landmark era in American history. A deluxe limited slipcase edition is also available. Pete Souza was the Chief Official White House Photographer for President Obama and the Director of the White House Photo Office. Previously Souza was an Assistant Professor of Photojournalism at Ohio University, the national photographer for the Chicago Tribune, a freelancer for National Geographic, and an Official White House Photographer for President Reagan. His books include the New York Times bestseller The Rise of Barack Obama, which documents the president's meteoric ascent from his first day in the United States Senate through the 2008 Pennsylvania presidential primary. Souza is currently a freelance photographer based in Washington, D.C. and is a Professor Emeritus at Ohio University's School of Visual Communication. Did you know that we offer audiobooks? Over 70,000 in fact! When you set up your account through Libro.fm you directly support Bluebird Books! Journey to https://libro.fm/bluebird today and create an account today!